What's that Nectar Mattress Smell? What’s that Nectar Mattress Smell? Any Nectar mattress smell is from fresh foam that’s been vacuum sealed. It is minimal compared to other foam mattresses and should be gone in a few days. It was so important for us that we figure out a mattress that is eco-friendly, cost-effective, and above all, comfortable. That’s why we use only top quality foam in our mattresses. And while other mattresses might have a stronger smell due to off-gassing, a technique that was popular with older memory foam mattresses, any smell on a Nectar is strictly from a vacuum sealed fresh foam. It’s Nectar’s goal to get a Mattress to you without the hassle of middlemen or a brick and mortar store. That means getting rid of the markups that can make a quality mattress more expensive. Instead, we vacuum seal the Nectar mattress at the factory and ship them to you from our distribution centers. That’s how Nectar is able to keep quality high while also keeping mattress prices low. While off-gassing and low-quality foam in early forms of memory foam mattresses lead to strong smells, Nectar has avoided those pitfalls. The smell that you get from unpacking a memory foam mattress is slight compared to those, and not due to any harsh chemicals. That being said it should dissipate quickly, and there are a couple of things you can do to hurry that process along. It can take your Nectar mattress between 24-72 hours to fully unpack so that it’s ready to sleep on. Your mattress smell should also dissipate in that amount of time. Occasionally, you may find that it may remain for a few more days after that, and this is largely due to the amount of ventilation you have in your room. Keeping your Nectar in a place with good air circulation will help to get rid of that smell quicker. If you’re still having issues after that, there are a couple of additional things you can do. Febreezing your mattress is an option, or using a diffuser with essential oils can help cleanse the air. We also wrote an entire blog post on how to clear your bedroom air the natural way, with baking soda, vinegar, and the air. Every Nectar mattress comes with a 365-day free trial window. That means that you can sleep on a Nectar every night for a year before you have to commit to it. That’s definitely enough time to make sure that you have a mattress that won’t have a Nectar mattress smell or lose its shape. Nectar is confident that after you’ve spent some time on a Nectar mattress that you’re going to come away thinking that it’s the best bed you’ve ever slept on. So what are you waiting for? 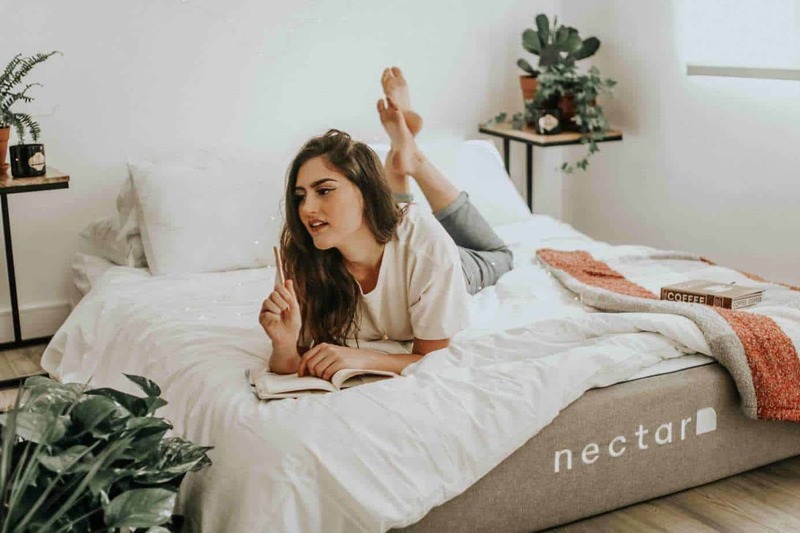 The quicker you grab a Nectar Mattress, the quicker it can acclimate itself to your bedroom, and with $125 off and two free memory foam pillows, it’s never made more sense to make the plunge. Sleep better tonight!